Protection of berries and fruits in open field and greenhouse. 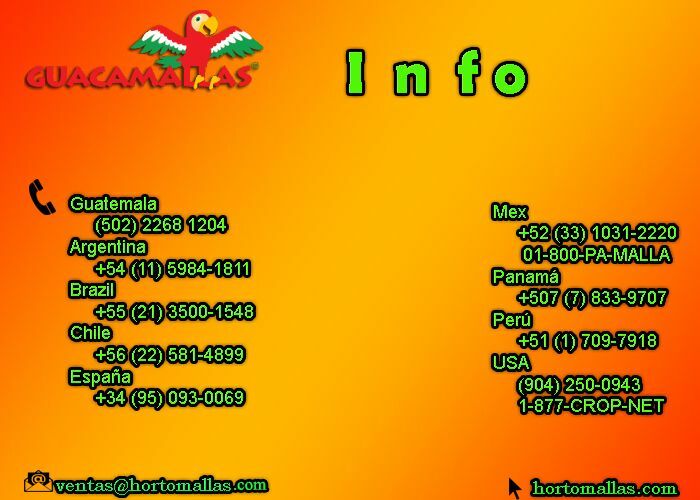 With GUACAMALLAS bird control nets you allow the best anti-bird proteccion for your crops! Congratulations! You just found the most cost effective bird control net and method (bird netting) for your berries, fruit trees and sweet corn! The damages caused by frugivore birds are not only quantifiable in quantity of product consumed by them, but by the fact that volatiles will pecke one fruit, then another and another… at the end they will have destroyed all your crop, substantially decreasing its commercial value since the visual impact of a fruit damaged by frugivore birds is not what the fresh market asks for. Unless you are working in the jams and jellies chain of production, you better protect your fruits with anti-bird netting! Furthermore, just one damaged fruit (by a bird or bat) in the case can be the source and cause for rot and fermentation of the whole package, therefore increasing the damage caused by birds! 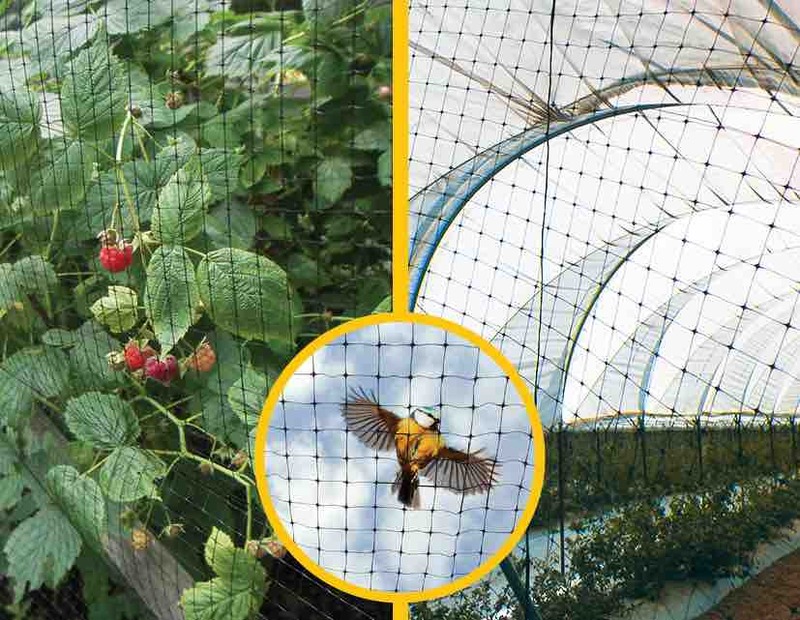 This is GUACAMALLAS´s job: this bird netting protects your fruit crops whether in the open field, greenhouse or macrotunnel for growing berries. Protecting fruits from birds (and bats) is essential for all sorts of berries, blueberries, blackberries, rasberries and strawberries, but also cherries, pears and other very sweet tropical fruits whose value decreases drastically due to bird damage! GUACAMALLAS es fácil de instalar, puede ser re-utilizada en varios ciclos de cultivos y viene en rollos doblados, fácilmente transportables. GUACAMALLAS solo es una barrera entre las cosechas y los pájaros, no perjudica a las aves ni las daña. La red antipajaros GUACAMALLAS es muy utilizada en la protección de elote fresco para exportación, donde aves como los zanates puedes devorar hectáreas en un día y dejar el agricultor en la ruina! Los sistemas anti-pajaros tradicionales como cañones de ruido, listones reflejantes o el famoso espantapájaros no sirven porque las aves se acostumbran a la presencia visual o intervalos de ruido y se acercan al cultivo para consumirlo. GUACAMALLAS is easy to install, can be re-used many crop cycles and comes in an easy to transport and move roll which is folded to a manageable size. GUACAMALLAS is only a barrier between your crop and birds and bats, it does not harm animals and it is not designed to catch them. GUACAMALLAS anti-bird netting can be used over sweet corn plantations. where blackbirds can eat hundres of acres in one day leaving the farmer broke! Traditional bird control systems like loud noise cannons, reflective tapes or the scarecrow or fake eagles and owls will not be useful for long, because birds will get accustomed to their presence and literally fly by them! If what you need is protection for your fruit crops against birds and bats and all that work that went into them, after all those months of investing and sweating hoping for a great financial result, GUACAMALLAS birdnet will be your principal allied for the final stage of your harvest! GUACAMALLAS anti bird netting is also used to protect ponds and acuaculture breeding tanks, avoiding any loss to marauding birds to shrimp and fish farms. GUACAMALLAS bird nets are also used to protect warehouses from pigeons in urban areas, as well as regular buildings that can be soiled by city birds. Anti-bird net is used effectively also to protect monuments, and historical buildings such as churches, temples or older public construction. Wherever you need to keep a high hygenic profile like food packing and storage plants where grains or fruits are handled, you will need bird control as an essential element of your security against pathogens brought by birds from the exterior.